EPICA held its third Open Day event at Maseno University on April 27th at the Kisumu Hotel’s Oseno Hall. Dr. Benson Nyambega, Director of Research, Publication & Innovation, welcomed over 40 local stakeholders on behalf of Prof. Chacha, the Deputy Vice Chancellor of Partnerships, Research & Innovation. The purpose of the Open Day was to engage in a dialogue with local stakeholders. 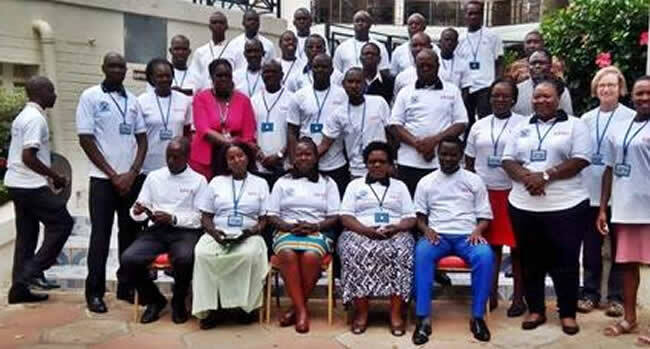 Those in attendance from the business sector included companies such as the Kenya Power & Lighting Company (KPLC), the Kisumu Water and Sewage Company ( KIWASCO), the National Museums of Kenya, as well as the National Industrial Training Authority (NITA). Further institutions from the tertiary education sector that participated in the conversation about EPICA were the Kanaan International College and the Ramogi Institute of Advanced Technology (RIAT). Michael Opiyah, the local EPICA Project Coordinator, introduced EPICA to the stakeholders in three stages. Following a general overview of the project, Mr Opiyah went into a detailed introduction about the proposed ePortfolio strategy at the heart of the EPICA initiative. He concluded with a presentation remarking on the pedagogical and technical requirements of the ePortfolio. Dr. Jackline Onyango from the Kenya Institute of Curriculum Development (KICO) highlighted the local distinctions as well as national development goals of the Kenyan educational system. By 2021, she said, KICO will have updated 20% of the current curriculum for primary and secondary schools, last updated in 1985. Highlighting a global discrepancy in digital literacy, Dr. Onyango pointed to programmes that could “re-tool” teachers to adapt online learning strategies. According to Dr. Onyango KICO is committed to roll out a competency based curriculum for higher education in 2019. The last presentation of the Open Day was held by Dr. Mildred Ayere, Director of the eCampus team. Dr. Ayere presented the Pedagogical and Technological team’s data findings from questionnaires previously sent to regional employers, trainers and trainees from the attending institutions. After a Q&A the attendees were divided into group sessions to encourage further lively deliberations among the respective employers, trainers and trainees.